Simmer 5: Is Community the Answer? The fifth episode of Simmer features an interview on the topic of community with community consultant Gaya Erlandson, founder of the Lotus Lodge Community & Learning Center in Candler, NC. For counterpoint, her comments are interspersed with reactions of a fictional Azerbaijani housewife named Gunay Qasimova. Community consultant Gaya Erlandson shares her perspectives on American culture and the importance of community. Topics include dynamic governance and intentional community. Erlandson is the founder of the Lotus Lodge Community & Learning Center in Candler, NC. For counterpoint, producer Carla Seidl voices reactions from Gunay Qasimova, a fictional Azerbaijani housewife whose perspectives draw from those shared with Seidl by several Azerbaijani women during her Peace Corps service in Azerbaijan from 2006 to 2008. The third Simmer episode features the first part of the documentary “Telling Our Own Stories” introduced by anecdotes about democracy from Seidl’s time in Azerbaijan. 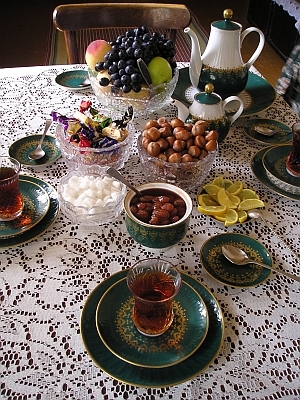 Producer and host Carla Seidl shares anecdotes related to democracy, localism, and corruption from her time as a Peace Corps volunteer in Azerbaijan (2006-2008). We then hear the first part of “Telling Our Own Stories,” the 47-minute-long documentary that Seidl produced in spring of 2013 on the life and work of media reform activist Wally Bowen, founder and executive director of the Mountain Area Information Network (MAIN) in Asheville, North Carolina. An essay from my experiences in Azerbaijan in the latest edition of Perceptive Travel. In this unnarrated sound collage, Seidl creates an aural painting of life in her village using recordings of sounds she often heard in her daily life there. She interweaves sounds of chores, animals, music, nature, and talking in the Azerbaijani language to give us a sense of a very rich and very other place. For the first year of my Peace Corps service, I lived in a small village in the north of Azerbaijan, a country that lies between Iran, Russia, Georgia, Armenia, and the Caspian Sea. There, the rhythm of life was different, the food was different, the language was different, nearly everything was different from anything I’d known before. When I closed my eyes and focused on my ears, I heard lots of sounds repeating themselves over and over again: sounds of animals, of chores being done, intermixed with more modern sounds of Turkish pop music from the satellite television. In the following sound collage, I tried to give a feeling for my village life using sounds I recorded in Azerbaijan in 2006 and 2007. This audio postcard from Azerbaijan was recently featured as part of WNPR’s first “Radio Adventure Theater.” Thanks to Where We Live Senior Producer Catie Talarski! A medley of Azerbaijani and South and North American songs, arranged and performed live by Carla Seidl (vocal, guitar), Sevindik muallim (tar) and Sarvan muallim (vocal) in Khanlar, Azerbaijan, spring 2008. Pictures are from Carla’s Peace Corps service in Azerbaijan, during which she lived in a small village in Oguz for one year and in the region center of Khanlar for another year serving as an English teacher in the local schools.